Breaking free from her mounting responsibilities on the Olympic Peninsula, Carson Stables owner Annie Carson reluctantly swaps muddy jeans for breeches to attend a dressage event in Southern California. But after settling into elegant digs at a historic mansion, she finds herself surrounded by palace intrigue, backbiting riders, and cold-blooded murder. As Annie makes heads or tails of clues scattered around the show ring, she must figure out which of her new acquaintances is a killer—before the crazed culprit takes the reins . . .
Annie Carson is at the center of another murder mystery in this book. While at a fundraiser for a worthy cause she is asked to go to Southern California with some horses to see if new homes/buyers can be found for horses that need a home with dressage riders. She decides to meet up at a dressage event and see if there might be customers that would pair with the horses in question. Little did she realize that murder would follow her when she travelled. As Annie meets the women being tested in the dressage event she finds more than one a bit to be spoiled nasty people that she would rather avoid. Thankfully the host and hostess of the event and a few others are not quite so obnoxious. With murders to solve, a missing person to find, people to meet, much to learn about dressage and the hope of seeing her friend Marcus while there she is kept very busy. I enjoyed this book and learned quite a bit from it. I have watched dressage on television and found the events to be mesmerizing. The horses are strong athletic creatures being ridden by people that almost look like statues…but what wonderful performances they can produce! I was interested in the training, the equipment, and the levels of horsemanship The tidbits about the history of the sport when women entered the sport were unknown by me before. I am eager to find out what Annie will get up to next and wonder if her next case will be closer to home. I also am curious about her relationship with Marcus and how that will eventually work itself out. Thank you to NetGalley and Kensington Publishing for the ARC – This is my honest review. 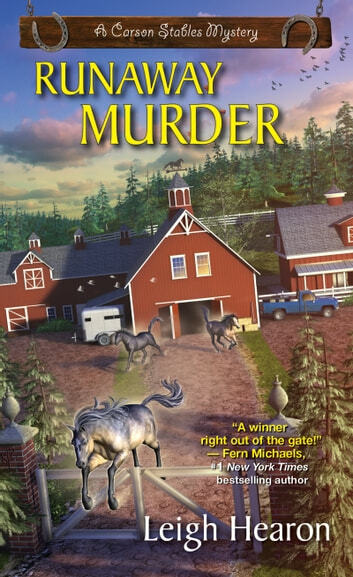 Runaway Murder by Leigh Hearon is the fourth book in A Carson Stables Mystery series. Annie Carson has an opportunity to attend a dressage event in Southern California. It will give Patricia Winters and Annie an opportunity to sell some of Hilda’s horses for Marcus Colbert. After acquiring appropriate clothing with the help of her friends, Annie heads to the estate of Hollis and Miriam Darby where the dressage event is being held. Annie and Patricia meet with potential buyer, Betsy Gilchrist and then head off for the evening cocktail hour. Annie is enjoying her martini when an officer arrives to inform them that Ms. Gilchrist is dead. They will have to wait for the autopsy to see if foul play was involved. Annie is introduced to the other guests who enjoy baiting each other with barbs. Someone even steals one of the rider’s good luck beads. The dressage event has barely begun when Judge Jean Bennett collapses. Despite the medic’s quick arrival, she does not survive. Annie deduces that Jean was poisoned and begins nosing around for the killer. Are Betsy and Jean’s deaths connected? Which of the guests disliked the victims enough to kill them? Annie intends to find out in Runaway Murder. 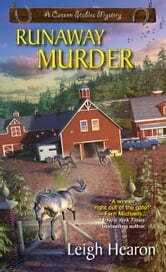 Runaway Murder is my least favorite book in A Carson Stables Mystery series. While it was nicely written, I found it dissatisfying. Annie did not seem like herself in this installment. She lacked friendliness and an open mind (at least in the beginning). Her attitude towards dressage did a complete turnaround by the end of the novel. Runaway Murder is dominated by horses and information about dressage (the pace was glacial). It was interesting to learn the history behind dressage. I wish, though, that the author had found a way to explain dressage in layman’s terms (like Laurien Berenson when she describes dog show events and judging). The mystery took a backseat for the majority of the book. In the latter half of the book, Annie starts taking an active role in searching for the killer. However, by that time, I had already identified the guilty party (it was a cinch). Plus, I did not understand her working against the police and Annie removing evidence (which messes with the chain of custody). I did like the method of murder and how it was achieved (unique). The maliciousness of the women got on my nerves after a couple of chapters (this was not a relaxing book). I found the author’s word choices incongruous with the story. It is not that I did not know the words and their meaning. It is that they disrupted the flow of the story. Some examples were quotidian, ersatz, contretemps, in situ, ebullient, and mien. I wondered if the author had swallowed a dictionary or had a calendar where you learn a new word each day. Annie had some romantic troubles with Marcus. Personally, I do not know what Annie sees in Marcus. The disagreements between them along with the women’s bickering was unpleasant. I do like that A Carson Stables Mystery series has a mature main character (she is 44), how they encourage rescuing unwanted horses, and I liked the addition of Chef Gustav. Chef Gustav was a lively character and the best part of Runaway Murder. If you are unfamiliar with the series, I recommend starting with Reining in Murder.